2019 is off to a great start here at Two Rivers Fishing Company. We have been busy getting the shop ready for the fishing season and enjoying the snow falling around our area, which should make for some great water conditions this summer. If you are thinking about booking a fishing trip this summer, don’t wait until the last minute. Our season is booking up fast and this summer should see a great fishing season. Our guides are what make our company work here at Two Rivers. We value them and understand that they are our connection from our shop to our clients on our fishing trips. 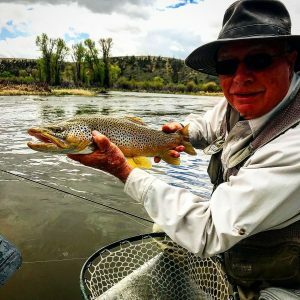 We feel we have, hands down, the best guides if you’re looking to fish the Green River or New Fork River. We have a large Guide Team, which ensures we can match you up with a guide that fits your fishing style, personality, or needs for the trip. We want to share a short “Get to Know Our Guides” video over the next few fishing reports so that you can get a feel for our guide team. This month we want to highlight Tim Scott. 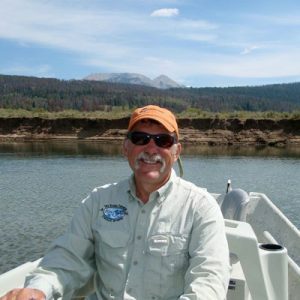 Tim is our most highly requested guide over the last few years and has been with Two Rivers for 12 years. Check out the video and guide bio page to learn more about spending a day fishing with him. 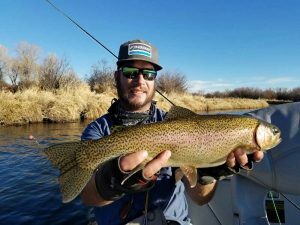 March-April – If you can tough the weather or pick a sunny day this is a great time to fish the Pinedale area. The snow is off the water, fish are hungry, rivers are a place of solitude. Typical day this time of the year is 6-15″ fish with a few over 20 inches. Streamers and nymphs are the best method! Scheduling Availability: EASY. The Green River is running very very clear under the ICE! We have a good start to the snow pack this season, but we still need a few good months of winter to be able to predict the summer water conditions better! The New Fork is such a special river- The river is ICE as of now, but this river opens up before the Green and we will start fishing it in March! We can’t wait! An early season brown from the NEW FORK! This river is still open near the dam, but the current weather is hard to withstand. We don’t guide on this section until spring! Ice fishing is in full swing and we have reports of some great fishing on Boulder Lake, Green River Lakes, and New fork Lake! Pinedale’s annual Ice Fishing Derby is slated for March, so don’t miss that!